MSUM will begin a once-in-a-generation realignment in July, which will send 31 university departments to new homes within five renamed and reorganized colleges. Following more than a year of discussion and revision, President Edna Szymanski sent her tentative decisions to faculty and staff last Monday. She took feedback until Friday afternoon and is expected to release her final decision by the end of the month. Among many changes, the tentative plan divides the sciences, which are now all housed within the College of Social and Natural Sciences, into two colleges, a new College of Science, Health and the Environment and a new College of Critical Thinking and Integrative Studies. It also breaks up the longstanding placement of mass communications within the present-day College of Business and Industry, sending the department to the new College of Arts, Media and Communication. Denise Gorsline, associate vice president for academic planning, said besides hiring a new dean, realignment will not affect university employment; nor will it physically change where departments are located. She added that although the university is interested in reversing declining enrollment, the plan isn’t marketing driven, but rather driven by students’ needs and workforce demands. In a February interview, Szymanksi also stressed career preparation. 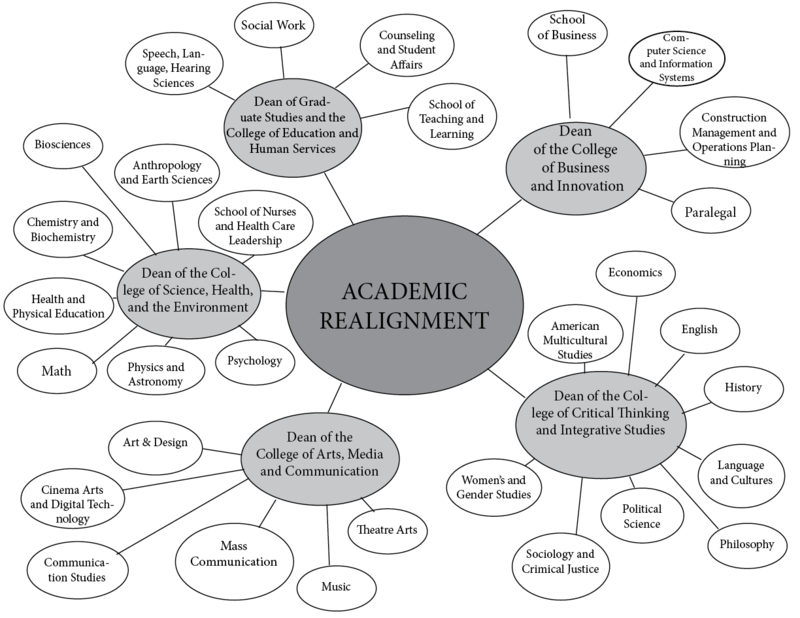 Formed in February 2012, the Task Force on Academic Realignment – made up of Provost Anne Blackhurst, two deans and nine faculty members – met every few weeks for nearly a year, looking at other universities’ structures and discussing many different models. Its meetings were not public, but it did solicit feedback through the provost’s office, the faculty senate and at town hall meetings. The task force members said they worked to create the most appropriate alignment for each department and also tried to ensure properly distributed workload among deans. Members wrapped up their work at the end of last semester, and then the Academic Affairs Council, made up of the provost, the two associate vice presidents and all five deans made revisions, which they released in February. Whereas the task force had kept most of the sciences together, in a February 11 letter, the council recommended placing most of the social sciences into a College of Global, Cultural and Public Affairs. But when Szymanski – who makes the final decision – released her tentative recommendations on Monday, the name reverted to College of Science, Health and the Environment. The Advocate spoke to a couple dozen professors from a broad range of university departments. Their reactions ranged from excitement and optimism to indifference and skepticism. Most of the professors didn’t feel comfortable going on the record with their v i e w s because they said they feared being seen as speaking for their departments while others were willing as long as it was clear they were conveying personal thoughts not others’. Political science professor Andrew Conteh said he’s not seen such a complete reorganization during his nearly 30 years at MSUM. Just like a river, he said, “academia should be seen as a constantly changing phenomenon” and we need to change with the times. His colleague, mass communications department chairman CT Hanson, said most faculty in his department support realignment, some envisioning collaborations of public relations and music industry or communications studies and advertising. Hanson noted – and his general notion was repeated in several departments across campus – that although most faculty members do not mind the change, mass communications is content where it is now. Interim director of women’s and gender studies Sherry Short said she doesn’t like the name of her new college, the College of Critical Thinking and Integrative Studies, but in general, is pleased with the plan. Craig, the astronomy and physics professor, said he supported keeping the sciences together because MSUM is one of very few schools to have that sort of structure. When it comes down to it, Craig said, most students don’t identify by what college they are in anyway. “Once you’re on campus, you ask them what college they go to and they will tell you ‘MSUM,’” he said. Craig’s hypothesis seems to have merit. Most s t u d e n t s interviewed didn’t know m u c h , if anything, about academic realignment and those who did, either hadn’t formed an opinion or just didn’t care. Accounting senior Rose Wietzema said MSUM is doing very well and doesn’t need drastic change. “I could see if we had problems, but there are no real problems,” she said. He said administrators considered student leaders’ input every step of the way. Gorsline said the 2013-14 academic year will be focused on the logistics of realignment – recruitment materials and website development, for example – but administrators will also start creating an academic master plan to turn structural changes into longer-term instructional changes (i.e. new courses, new majors and minors). “I think some of the most interesting collaborations are cross-departmental, not interdepartmental,” she said. Some examples the task force proposed include a Center for Global Health Care Leadership and a Center for Leadership and Social Change. Communication studies professor Rebecca Gardner is among several professors who enthusiastically support these ideas. “The college’s intention to create collaborative ‘centers’ will help us to ensure this is not just a change in name only,” she said. Gorsline stressed the long-term nature of such a thorough reorganization.